Double-bill of fantasy adventures based on the novels by Lewis Carroll. 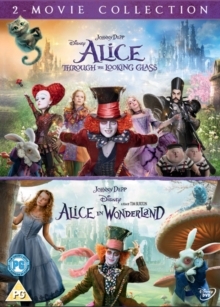 In 'Alice in Wonderland' (2010), Alice (Mia Wasikowska) returns to the magical world of her childhood adventure to reunite with her friends the Mad Hatter (Johnny Depp), the White Rabbit (voice of Michael Sheen), Tweedledum and Tweedledee (both played by Matt Lucas), the Dormouse (Barbara Windsor), the Caterpillar (Alan Rickman) and the Cheshire Cat (Stephen Fry). In 'Alice Through the Looking Glass' (2016), Alice finds herself in a mysterious, alternate world after going through a mirror and emerging on the other side of the glass. While there she discovers that the Mad Hatter is in danger and that Wonderland could be turned into a wasteland by the evil Time (Sacha Baron Cohen). As Alice tries to turn back time in order to save her friend, she once again comes face-to-face with the Red Queen.